I once tried very hard to meet Jane Jacobs. Her writing, as for innumerable planners before me I am sure, helped direct me towards the profession. My opportunity was absolutely engineered by me. Schemed, you might say. While in planning school in 2005, I discovered that a friend of my father’s had grown up with the Jacobs children, and was still close with them. I pounced, of course. I was going to Toronto in a few months for a student planning conference. Would Sheila help me get in contact with her? Of course she would, Sheila was very encouraging. I felt a little odd about it. Sheila was a friend of my father’s, but I didn’t honestly know her that well. And Jane must have had this sort of thing happen all the time, eager young planners wanting to make a pilgrimage? But it was a chance to meet an icon, so I forged ahead. Sheila gave me the number at the house, and she let Jane’s son James know that I might be getting in touch. I called when I arrived in Toronto. I talked to James, who was very nice. I let him know the scenario, that I was a planning student who knew Sheila and who was very eager to meet his mother. He told me that she had just returned from a period spent in the hospital (she had broken her leg, I think), so was just settling back in. But if I called back later in the week, he thought it possible that we could arrange a meeting. Jane was, as you would expect, a very industrious lady. Her time in hospital had put her behind on various projects (she was likely working on Dark Age Ahead at that time, her final book). Who knows how many other engagements or projects she was involved with? When I called back later in the week, James told me the bad news: she was indeed very busy and didn’t feel she was ready for visitors. But he got her on the phone so we could speak. The conversation, from my perspective, was a little awkward. How do you have a conversation like that? 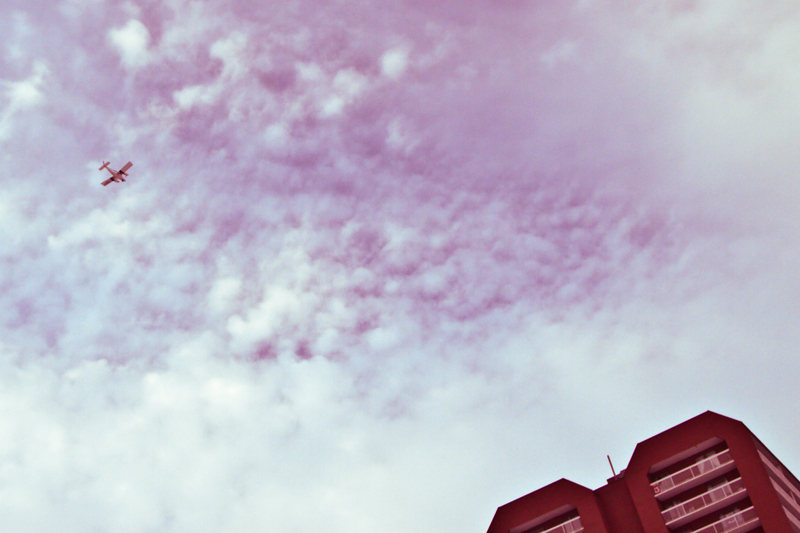 I was a wide-eyed planning student, hoping to meet someone I’d placed on a pedestal. I had imaginings of sitting down to tea with her (or maybe beer, she apparently really enjoyed beer) in her living room and talking about cities, soaking up big heaping gobs of juicy planning thought. I imagined impressing her with my own thoughts, my interest and drive. Coming away with the Jane Jacobs Stamp of Approval for my career aspirations would have been the ideal outcome. But that was not to be. There were some apologies offered by her for not being able to get together, expressions of disappointment from me (masked, of course, so as not to seem too eager), a bit of discussion about why I was in Toronto, and then we started talking about: Sheila. Jane, with the tone of an interested mother, wanted to know all about her recent activities. Mild panic on my part. Those were tough questions for me, not knowing Sheila very well. But how could I tell Jane that, after I’d tried so hard to work the connection? I did my best not to let on, and luckily I knew (just) enough to answer her questions. And that was it, my claim to planning fame. She died in 2006, so I never got another chance. I was disappointed at the time at how it had turned out, but not anymore. I chatted on the phone with Jane Jacobs about her family and friends. How many planners have done that? Pretty cool, I think. 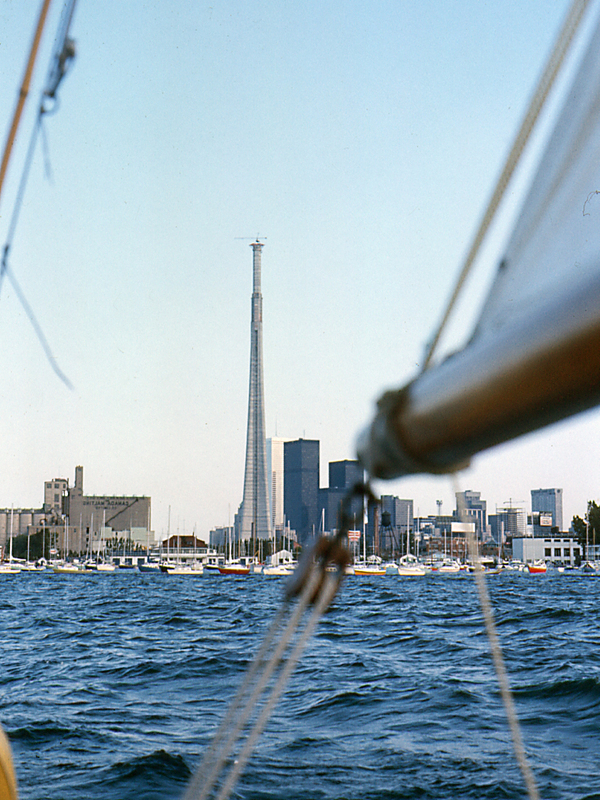 My father took this photo when the CN Tower was under construction in 1974. The Burj Dubai recently surpassed the CN Tower as the world’s tallest structure, beating it out by some several hundred meters. Too bad for Toronto. But it makes me wonder what it must have felt like in Toronto in the ’70s to see something like this go up. What must it have done for civic pride? How did it change the identity of Toronto? I suppose some people inevitably don’t like this sort of thing. Many Parisians apparently hated the Eiffel Tower when it first went up, before it became the unimpeachable symbol of the city. But it seems like a tremendous statement about a city and its attitude, to me. Bold cities make statements like these. Of course, I suppose foolish cities might also make these sorts of statements. A city like Edmonton would need to change a lot before it could ever convincingly pull off a statement such as the CN Tower. But it could certainly use an injection of that daring and inventive spirit.